If you’ve never lived in a home that uses propane for heating and cooking, you may be unsure about the safety and reliability of your propane tank. Propane is among the safest energy sources available, and a first-time user can easily adapt to using propane. Check your tank for contact information. This information may be found on a sticker placed on the tank. The information may be as basic as a company name or logo or may also include information such a phone number for the company. If there is no contact information to be found, check with your landlord or the previous homeowner to find out which propane company services the tank. Keep in mind that it does make a difference whether the tank is leased or purchased. If the tank is leased from a particular propane company, by state law you must fill that tank with propane from that supplier. A tank that has been purchased belongs to the purchaser and can be filled with propane from any supplier that you choose. Contact the propane supplier for information on contracts that may already be in place, and to establish a customer relationship with the supplier. Most propane companies maintain service records of tanks that they service, identified by their location and serial number. They also can give you information on prior usage, which can be helpful in determining if your usage falls within the normal range for your home. That’s it. Beyond calling the supplier when you need a delivery or setting up an account with the supplier’s auto-fill and price protection programs, there is really nothing else a first-time user needs to do, except enjoy their propane system. If you’re building a new home and will be using propane as an energy source, you have just a few more items to consider. nk. Weigh your options and choose carefully. Siting the tank. Choosing a location for your propane tank depends on a number of factors. The location of the tank must be easily accessible for supplier trucks to fill it. This means that the path to your tank needs to be free of overhead obstacles such as low-hanging tree branches and electrical wires, as well as underground concerns such as sprinkler systems and septic system covers. A supply truck can weigh more than 10,000 pounds and is not easily maneuverable, so providing a clear path to your tank is essential. Your propane supplier can assist you in determining placement of your tank. Can my propane tank explode? It’s unlikely. Propane tanks are extremely strong and safe. Governmental requirements and industry standards dictate the thickness of tank walls as well as the safety mechanisms and protocols used for every tank. This means that your propane tank will continue to serve you – safely – regardless of hot weather, a fire, or something hitting the tank. Can I paint my tank to make it less noticeable? Propane tanks can and should be painted, but there are regulations regarding color. In general, only light, reflective colors should be used – typically, silver, white, or light gray. 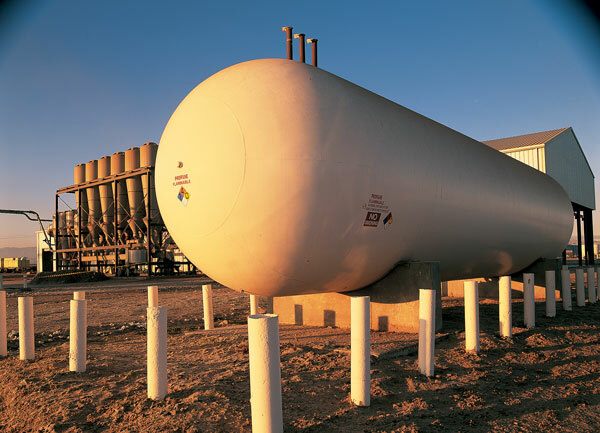 Your propane supplier can offer guidance on painting your tank. Can I landscape around my tank? While it’s understandable that a homeowner would want his propane tank to blend in with the home’s surroundings, you must be cautious about placing fencing, shrubbery, or other decorative elements around your tank. Again, your propane supplier can offer you guidance on this issue. Propane is an odorless, colorless gas, and because of this, propane manufacturers add ethyl mercaptan, an odorous gas, to help human noses detect leaks. The smell of this additive has been likened to rotten eggs or cooked cabbage. You’ll know it if you smell it, so if you do, contact your propane supplier. They can test your system to determine if you have a leak. A homeowner’s or renter’s first experience with propane may feel uncertain at first, but propane is among the safest and cleanest fuels available as an energy source today. If you have any questions about your propane system, contact your supplier. Propane suppliers believe in their product and their industry, and will happily answer any question you may have.